One of the best uses of augmented reality is for navigation. 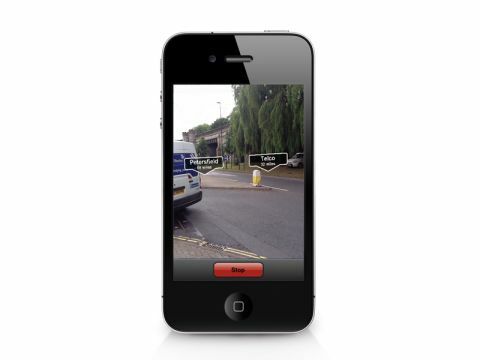 The Heads Up Navigator combines GPS positioning with augmented reality to help you find your way around. When you start the app, you're prompted to add a location by clicking the '+' icon. You're then taken to a Google Maps view of your location. Typing in an address into the 'Location search' text box should in theory bring up the location you want to go to. Unfortunately the results are hit and miss. We tried typing 'Sainsburys' to see if it would find one of the many stores in Bath. Instead it returned a 'location not found' error. Typing an address also proved fruitless, but entering the postcode gave the results we wanted. As with a car GPS device, as long as you know the postcode, you'll find your way. It's functional, but not that user friendly. For locations closer to your current position, you can drag the marker to where you want to go, but this seemed to crash the app. Not a great start, but once you've managed to add the location and save it, you click 'Start live view' and things begin to improve. Your saved locations hover over the landscape and point towards where you want to go. It's clear – and most importantly of all, it's accurate. The distance between you and your desired location is clearly labelled and it really does help you get your bearings. The basic Navigator is free and includes adverts, while the paid-for app is £0.59. The adverts aren't very intrusive and there are bugs that still need to be ironed out, so we recommend using the free version for the time being.